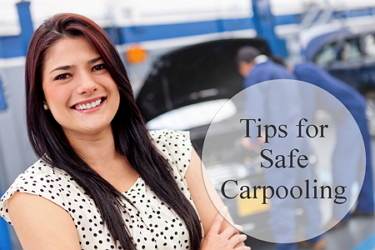 Rideshare and Carpool Safety Tips. Joining a Rideshare / Carpool is a great way to save money and it's a little easier on the environment. The cost of splitting the cost of fuel, and tolls between 3 or 4 people is nearly always cheaper than taking a bus, train, plane or a car alone, and it's a whole lot more sociable. We've heard from LifeSocial Rideshare users who have made friends and have had awesome adventures through the rideshare service. Going for a drive with strangers has different risks than buying or selling items and while your parents may of taught you to never travel with strangers, I agree. The idea is that you get to know them before going for a ride, so therefore they are no longer strangers. As always, go into a transaction looking out for your own safety, and don't do anything that seems unsafe. Here are some tips to having a safe and pleasant ride share experience. If you can, organise to meet the other people in the rideshare before hand. If not possible take the time to chat to them through the messenger, look at their Facebook profile. Take a look at their social networks and their friends, google their name and make sure they seem like someone you would be comfortable on a long drive with. Look at the reviews others have left on LifeSocial Rideshare for that person, if no reviews have been left seek references from their friends. Take a note of the number plate and vehicle type listed for the ride, on the day if there are inconsistencies such as a different vehicle and different number plate, consider this a red flag. Ask questions about driver, car. Agree on details like cost, payment, and whether any side trips will be permitted beforehand. Always tell a friend when you will be leaving, and arriving and provide them with a photo of the vehicle and number plate that you are getting into. If you feel uncomfortable asking for any of this information, say something along the lines of "I have a mother who is always worrying about me, she feels much better if she knows who I am with." Agree on rules for the road. Music preferences, whether food, coffee, smoking, or perfume will be permitted, who will be sitting where - it will cause less tension on the ride if everyone has agreed ahead of time on what is and is not permitted. Don't give too much information about yourself in your ad. Keep it minimal, listing only the need to know details such as when and where you are going, if there is room for cargo (or you have cargo that needs to be transported), that you are bringing your dog with you, and other trip oriented details that might be make or break for the other parties. Include Age and Gender as some people prefer to travel with people of a similar age, or have a preference towards what gender they travel with. Example: some women prefer to travel with other women only. Exchange important numbers. Get the main contact details as well as emergency contact numbers beforehand with all who will be travelling with you. You never know when a medical emergency will strike, or if you will need to alter plans at the last minute. Make sure your phone is fully charged before you leave. Go with your gut. If the other person says something that makes you uncomfortable, don't go with them. If they put you on edge before you even get in the car, you will likely be in for an unpleasant ride! If you feel uncomfortable at anytime during the trip, exit the trip.